Made with biodegradable paper and embedded with seeds, you can now grow wildflowers with this free wildflower seed plantable paper. Watch the seeds grow in to pretty flowers as the paper decomposes, plus you enjoy the freedom from allergies with wildflowers. 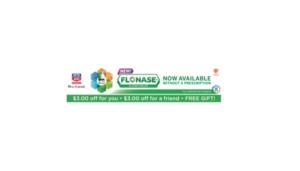 To request your free plantable seed paper along with $6 of savings from the new Flonase allergy relief, fill in this quick form.